A Grassroots Unwired, we started with a simple principle: Technology can and should create a social impact: grow a constituent base, raise more money, advocate for a cause, and most importantly, be mobile. Tools geared towards non-profits only focus on the online or CRM space. There were no tools that help non-profits reach donors where they are, until now. Grassroots Unwired has a released a new feature that we believe changes the game in helping your organization gain new supporters and it’s called Nearest Neighbor Lookup. There is nothing more powerful than additional validation when it comes to getting new supporters to donate to your organization. When you knock on a potential supporters door, how do you let them know about others around them who have already joined your cause? 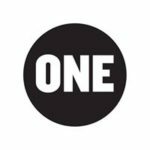 As a major band’s concert tour kicked off in Vancouver in May, then continued to travel through the US, Europe and South America, the ONE Campaign, the campaigning, and advocacy organization of nearly eight million people around the world, has been setting up shop at stadiums across North America to generate support from concertgoers in the fight against extreme poverty and preventable disease. To facilitate the actions taken by concertgoers, ONE has been traveling with the Grassroots Unwired mobile platform! Concertgoers are asked their country of origin and based on their response are presented with a digital letter or petition that they are asked to sign. ONE loaded 13 different letters into the app and using GRU’s randomization technology, ensures that there are a variety of messages being delivered. We even give them the ability to customize each letter by allowing people to write a personal message within the text of the letter. Those letters are then sent to a member of the U.S. Senate or another public official and all the data is added to the ONE’s ActionKit instance in real time. ONE is dedicated to making a real difference around the globe and we couldn’t be prouder that they are using our tech to make their work more efficient and effective. 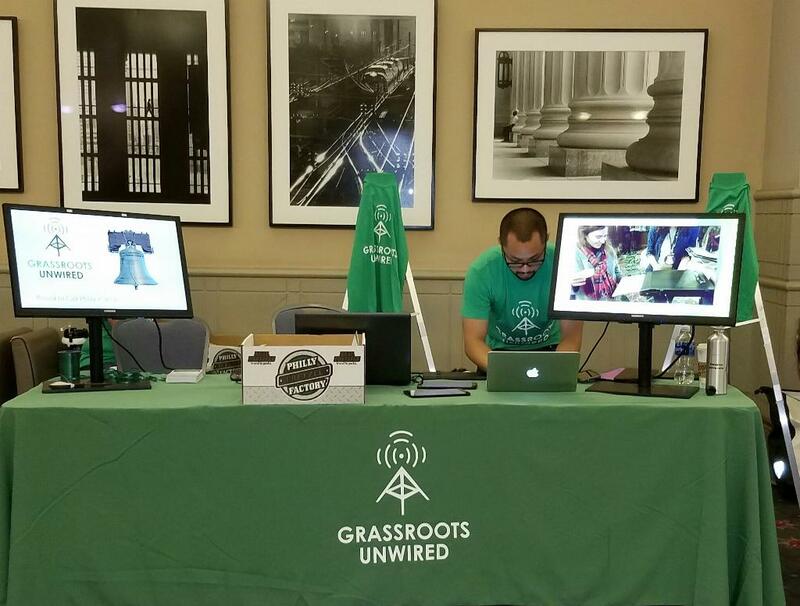 Request a meeting to see how Grassroots Unwired can enhance your field program too! Online advocacy tools are ubiquitous. But what do you do at a huge outdoor social event where you can’t be in front of a computer and connectivity is always dicey plus the pace is super fast and you have multiple locations across the country at the same time? Human Rights Campaign needed a solution to collect member and supporter information that was safe, secure, accurate, and available on a national level in real-time. 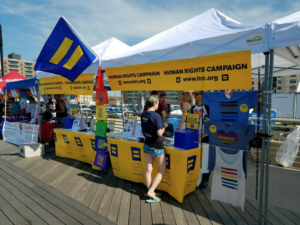 It was also important that their new donors were followed-up with and thanked as soon as possible after the interaction at a Pride booth. Grassroots Unwired worked with HRC to ensure that our platform met every need they had. The “off the chart” numbers they produced this past summer tell the story. HRC has been using the Grassroots Unwired platform for their street canvassing efforts for about a year now. When the Pride team saw the awesome impact our tech was having on their canvassing numbers, they wanted in. We are so pleased to report that we have submitted three amazing session ideas for NTEN’s NTC 2018. NTEN is the Non-Profit Technology Network which runs an annual conference that brings together a slew of people from all over the country who work for non-profits or the companies that support them. Since Grassroots Unwired makes a big impact on many nonprofits, we decided to step up and submit about the collaborative work with our clients. We are excited to announce the following sessions are available for public voting. Voting has started and runs until Friday, September 1, 2017. The rules are that you have to create a login on the NTEN website in order to vote for us and you can only vote once. Session #1: How Mobile Technology can help with social service outreach. Session #2: Are you getting the most out of every public event you plan? Session #3: How to build your sustainer base one door at a time. If those links don’t work, head on over to https://www.nten.org/proposals/. In order to find the sessions, search for the keyword: Grassroots. We come up on the first one or two pages. Contact us if you want to talk about the platform. Grassroots Unwired is built on the philosophy that mobile-first technology can be customized and utilized for the greater good. From helping progressive candidates win elections to empowering non-profit organizations working to save our environment, balance inequality and improve our communities, Grassroots Unwired bridges historical canvassing with groundbreaking technology. We are transforming the way our clients galvanize support for their candidates and their causes. Each month, we make two platform releases which include new features, custom programming for individual clients and improvements to existing features that benefit everyone using the platform. Recently, a release included an exciting new integration that we wanted to make sure you knew about. One of the great strengths of the Grassroots Unwired platform is the ability we give our clients to seamlessly integrate other tools that they use for their advocacy efforts with the GRU platform. Now the data collected during F2F advocacy on the GRU platform, can be sent in real time to your ActionKit instance so your new supporters can become part of your outreach effort immediately. More Integrations – Grassroots Unwired has several CRM integrations. BYOP(rocessor) – If priority one for you is F2F fundraising, our donation capture and processing is better than any other mobile product on the market. Now we have opened up our platform to over 70 payment gateways to give you the most seamless payment experience possible. Last Month, Russ and Jordan headed down to DC for our inaugural appearance at NTEN’s 2017 NonProfit Technology Conference. That was fun. They talked with hundreds of non-profits about the platform and used our tech to collect petition signatures supporting Meals-on-Wheels and ultimately made a $250 donation. We have four awesome interns coming on board for the summer. They are currently attending Penn State, Philadelphia University, Georgetown, and Temple, and we can’t wait to get them on board once the school year ends. We’re also hiring on both the Sales and Tech side. Head on over to our Careers page and check them out. Please encourage any current college students you know to apply. Thank you NTEN, We Loved it! With our current state of affairs in the U.S., it is easy to wake up each day dejected and pessimistic about the future. But for 3 days last week, I woke up knowing I would be heading to the annual Nonprofit Technology Network (NTEN) conference. Detractors may say we were in a bubble, surrounding ourselves with idealism run amok, but for 3 days I saw everything that is great, compassionate and hopeful about our country. I met hundreds of people who choose to devote their work life to putting the needs of others before themselves – they deserve far more recognition then they get. 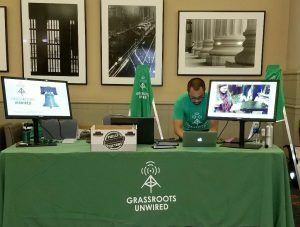 While the NTEN attendees are on the front lines fighting their battles, we at Grassroots Unwired strive to be the support behind the scenes they can use to make their efforts more efficient and effective. Technology can be a great equalizer across society and our goal is to make sure it supports those who fighting the good fight so admirably and selflessly. It is humbling to have even a small opportunity to be a part of this. It was a pleasure to be a part of the NTEN conference and we not only look forward to being their next year but participating in their events all year long. Grassroots Unwired is pleased to announce that for the first time, we will be at NTEN’s Non-profit Technology Conference. Come see what all the buzz is about our technology. We’ll be happy to show you in person how we can upgrade your face-to-face program or advocacy work with our amazing features. See our mobile app in action and sign a petition telling Members of Congress to fully fund Meals-on-Wheels. If you are not able to come see us in person, request a demo or sign-up for our newsletter. Grassroots Unwired offers a mobile-first platform for nonprofits doing face-to-face outreach, advocacy, and fundraising. Reach people where they are, capture everything, and grow your movement. The Ballot Initiative Strategy Center held its annual conference in Las Vegas last week and Grassroots Unwired participated in the New Tools Shoutout where 16 organizations vied for the prize of Best New Tool from 2016. Using a real-life use case from Fieldworks, we won the hearts and minds of the audience and emerged victorious with a sweet new water bottle as the prize. Petition drives can be about so much more then getting on the ballot – if you have the right tools. Use our Barcode tool to tie the Petition signer back to the form they signed along with the GPS location and time that the signature was collected and the name of the canvasser who collected it. Now more then ever, ballot initiatives are a critical way to push your agenda and fight against legislative overreach. You want to know when, where and how every signature you get was collected and walk away with actionable data that will enhance your campaign efforts far beyond the petition drive. Get in touch with us to learn how the Grassroots Unwired mobile platform can make this a reality for you and your organization.